Beckley Exhibition Coal Mine - Cass Scenic Railroad - New Tygart Flyer - The Potomac Eagle - Western Maryland R.R. *SEE THE BOTTOM OF THIS ARTICLE FOR A SPECIAL OFFER THAT WILL SAVE YOU $200.00 PER COUPLE ON THIS TOUR. 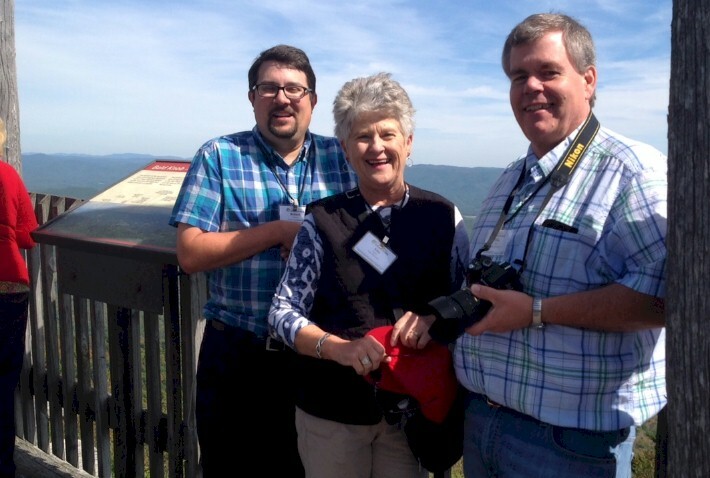 In late September 2015, we, along with our friend and traveling companion Mike Pace, had the chance to ride some of the most scenic mountain tourist railroads in the eastern part of the United States. 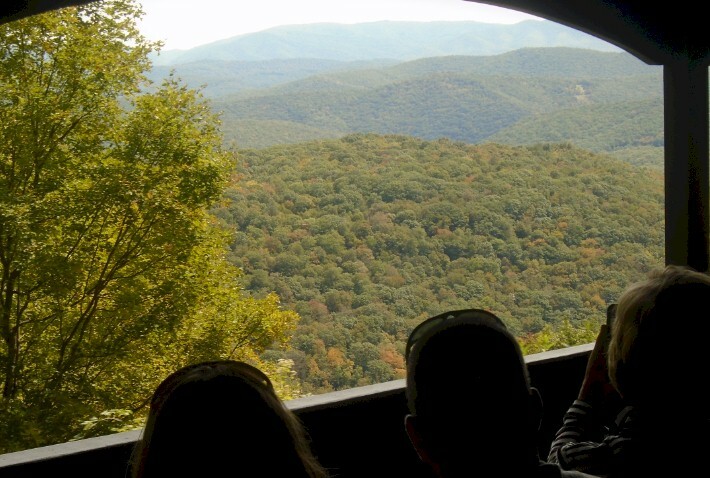 Since navigating the curvy mountain roads of West Virginia and Western Maryland isn't for the faint of heart, we decided to go with a six-day, seven-night motorcoach/rail tour package that is being offered by a company called Country Travel DISCOVERIES. 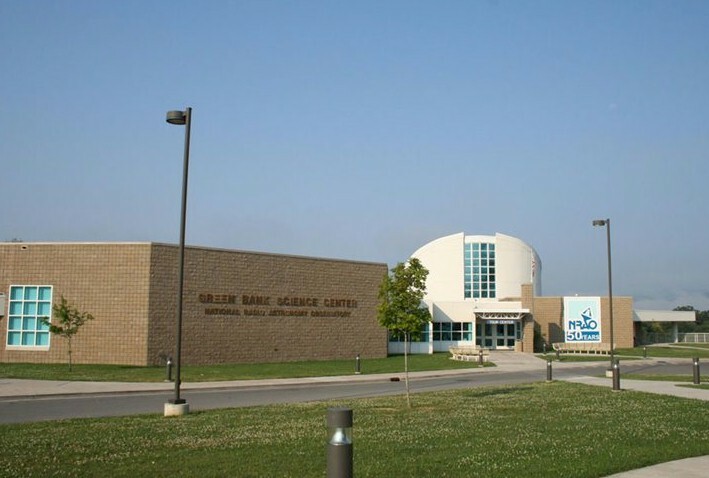 The business is located in the western suburbs of Milwaukee, Wisconsin, but its tours cater to travelers from all across the United States; we had people on our tour literally from California to Florida... and everywhere in between. Country Travel DISCOVERIES is a relatively new name for the former World Wide Country Tours, which had been in business for more than four decades, offering travelers "off the beaten" generally rural-themed tours. Even though we haven't done a lot of group tours in our past, it was very convenient to have all of our hotel and train arrangements made in advance for us by Country Travel DISCOVERIES. 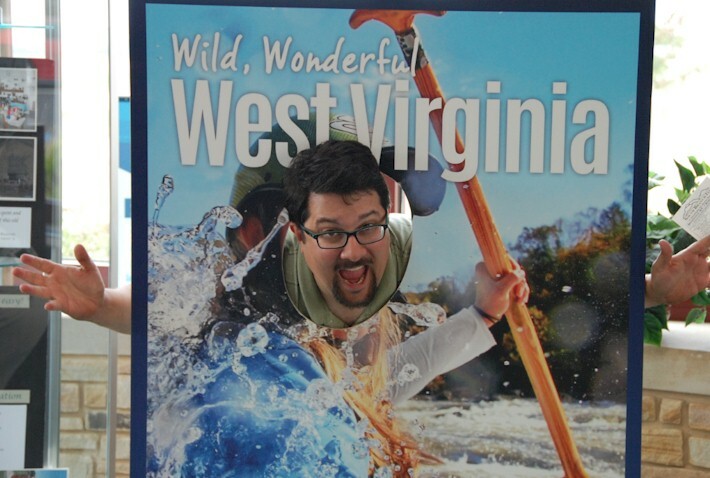 It is the best way to see all of the West Virginia tourist railroads with the least amount of hassle and having all of the driving done for you. Spending the week with other travelers who also enjoy trains and exploring the beautiful fall colors was an added benefit. 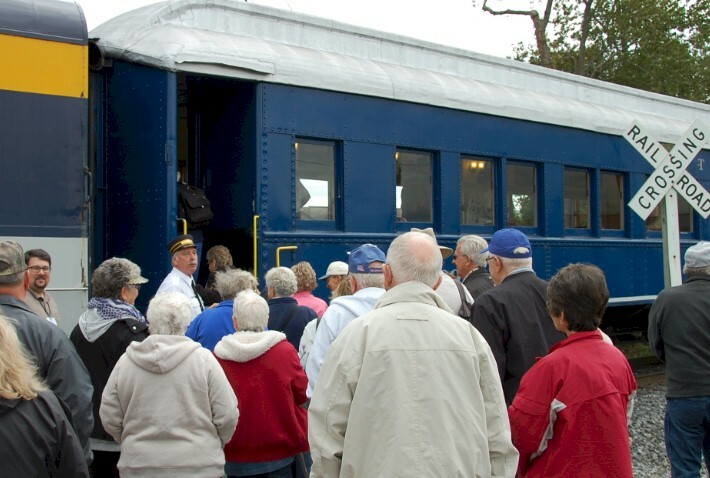 The tour started and ended in Charleston, West Virginia, and included rides on five different trains - Beckley Exhibition Coal Mine, Cass Scenic Railroad, New Tygart Flyer, the Potomac Eagle, and the Western Maryland Scenic Railroad. Besides just the trains, the tour package offers other non-train related stops at interesting locations... like a small business where salsa is produced, the New River Gorge National River, a theater performance about what life was like in West Virginia coal camps, and another small business where glass art is designed. What a fun and action packed week if we do say so ourselves! 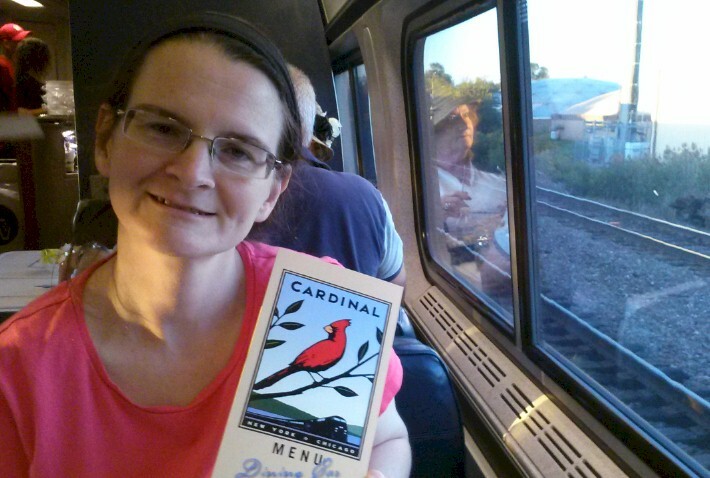 We headed out to West Virginia on Amtrak's Cardinal (Train #50)... it was a quick ride from Chicago's Union Station. You get on the train at 5:45pm, have dinner, go to bed, and by the next morning before 9:00am, you're pulling into Downtown Charleston. We opted for the roomette on Amtrak, which is a nice upgrade from coach, but isn't quite as big as the full deluxe bedroom. 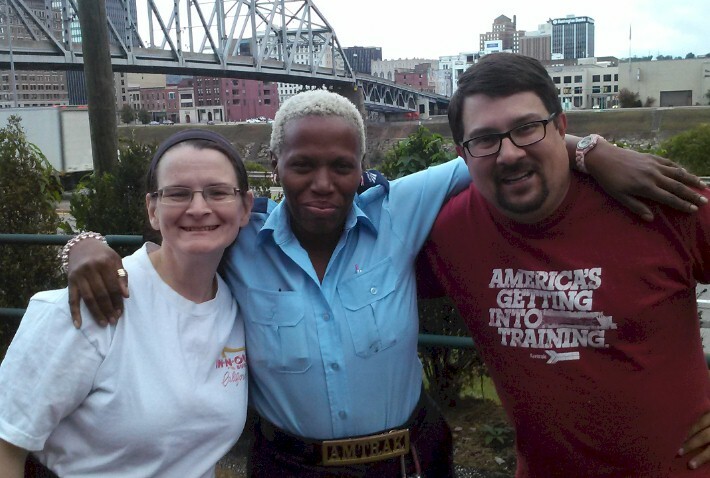 If you are considering taking the Country Travel DISCOVERIES tour, you may wish to consider using Amtrak. Mike, and many other people on the tour, decided to fly into Charleston's Yeager Airport. This is also a great options for travelers; the airport has only a handful of gates, which makes it very easy to get in and out of. One only has to show up about 30 minutes before their flight departure time here and there is almost never any back-ups at the security line. The first day of Country Travel DISCOVERIES' West Virginia's Mountain Railroads tour is considered a "travel day", with all travelers being asked to arrive in Charleston, West Virginia by no later than 5:00pm that evening. 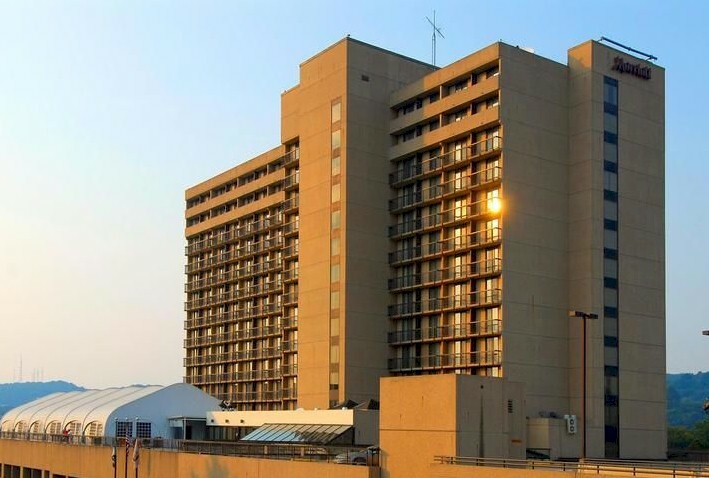 We got in a little before that and settled into our room at the Charleston Marriott Town Center hotel; it was conveniently located right across from the largest mall in the state, and was in easy walking distance from various restaurants, attractions, and shops. There was even FREE parking provided by Country Travel DISCOVERIES for those who chose to drive to Charleston, WV. We gathered just before 7:00pm in one of the conference rooms for our Welcome Reception and a chance to meet our fellow travelers. Our tour director for this trip was Ann Kaiser, a retired magazine editor who worked for Taste of Home and Country Woman; she lives in the western suburbs of Milwaukee. All of the tour directors with Country Travel DISCOVERIES have an extensive travel background and have been leading group tours for many years. 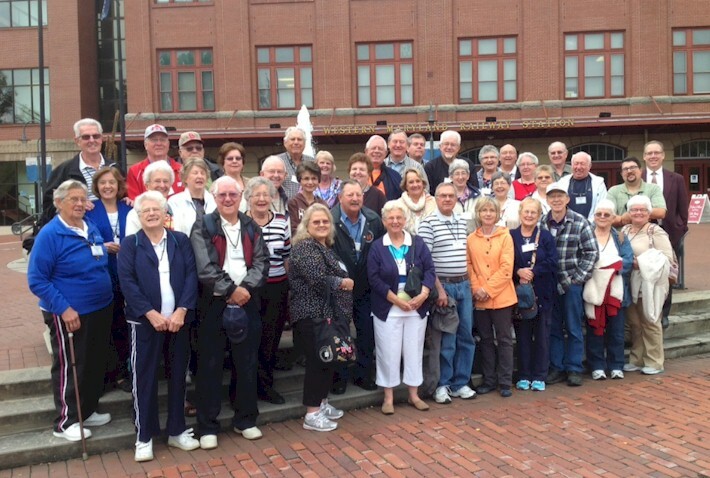 We had a pretty full group of 38 other fellow travelers for our September 22-28, 2015 tour. The vast majority of travelers have gone on many Country Travel DISCOVERIES tours before, including their tour that is offered of Colorado's Railroads (we hope to go on that sometime soon and write an article for you!). 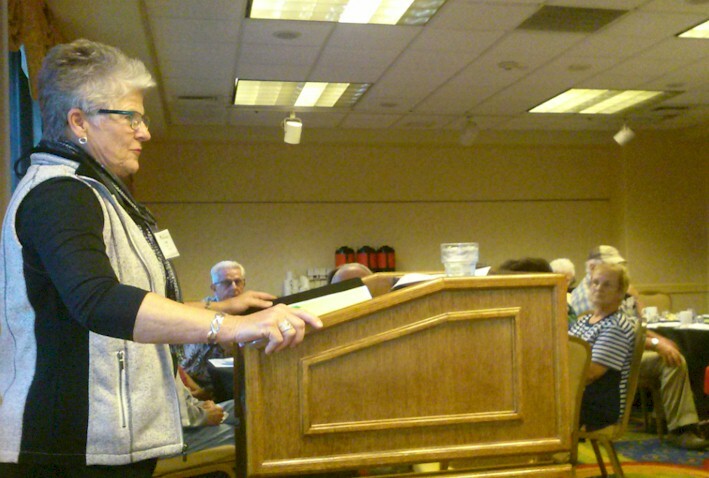 At the Welcome Reception, we went over a brief rundown for the week and other announcements. Each traveler also got the chance to stand up and provide a brief introduction about themselves. From there, it was time for a late dinner and a brief workout in the hotel gym before bed. Day #2 (which is actually the first full day of touring) started with an amazing breakfast buffet at the Charleston Marriott Town Center... then hitting the road around 8:00am. Our motorcoach driver was named Patrick Lyons; he was originally from the Midwest, but was now calling Pennsylvania home. He had just done the August 18-24, 2015 departure for the Country Travel DISCOVERIES West Virginia's Mountain Railroads tour... so he knew the route very well. Instead of taking Interstate Highway 64, Country Travel DISCOVERIES lived up to their reputation of taking travelers "off the beaten path", and instead, proceeded down U.S. Highway 60. This was the "old way" to get through West Virginia's Appalachian Mountains... before I-64 was built... and was going to be a lot more scenic than any freeway! 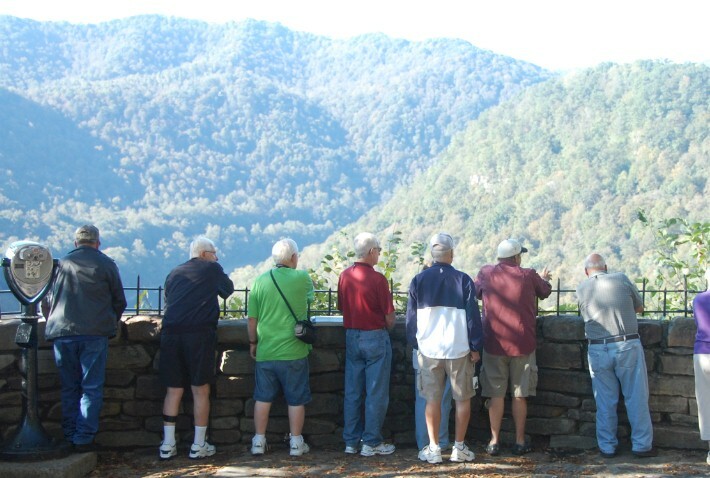 The tour made some interesting stop in the morning along U.S. 60... including at Kanawha Falls, a small business where salsa is made, an overlook at Hawk's Nest State Park, and a stop at the New River Gorge National River. 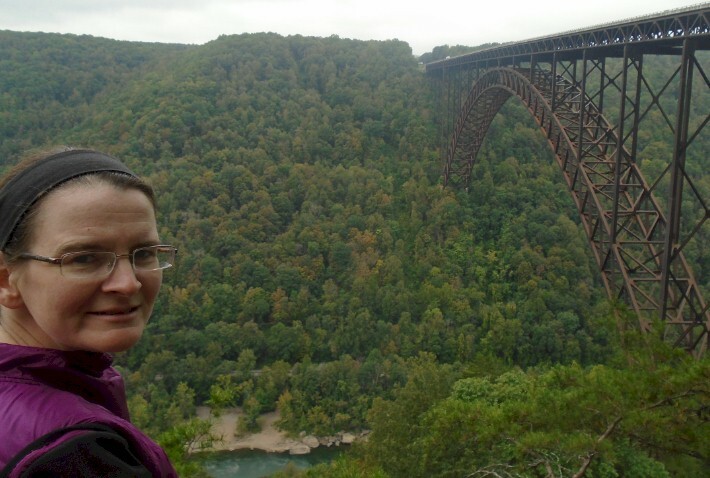 The New River Gorge is a unit of the National Park Service; travelers can spend time looking through the exhibits at the new Visitor Center, or navigating about 200 stairs to walk down to an overlook of the famous U.S. 19 Bridge over the Gorge. We stopped for lunch that day at Smokey's on the Gorge, a restaurant located just a stone's throw away from the New River Gorge. 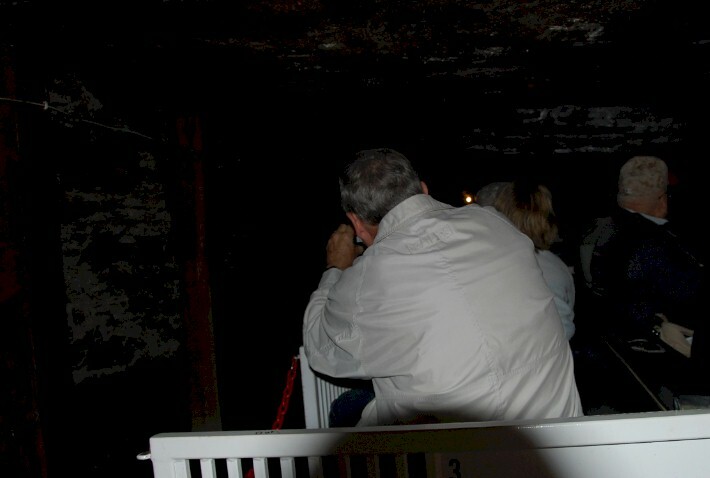 The afternoon of Day #2 continued with a trip down to Beckley, West Virginia, and a tour of the underground coal mine that is owned and operated by the city; it boasts 1,500 feet of underground passages. 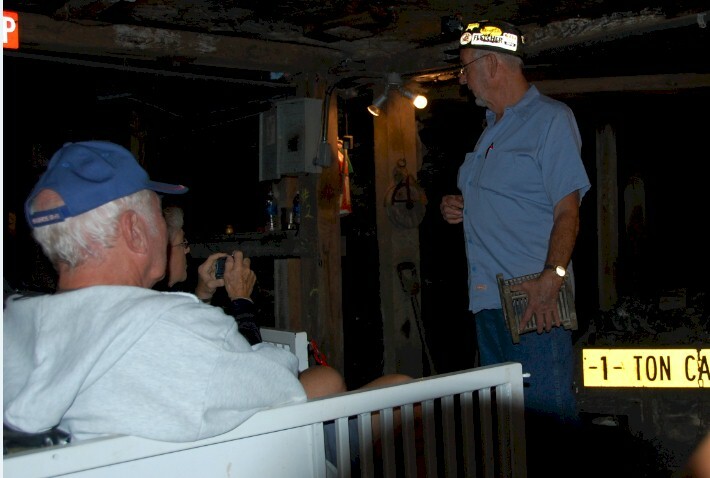 Our tour began with a chance to view a display of mining artifacts and portrayals of early life in the coal towns of Southern West Virginia. The highlight is, of course, a fascinating journey below ground with an experienced coal miner in an authentic, track-riding "man car". Our tour guide had actually worked in this and other mines during the 1950's and 1960's and shared a lot of his stories. 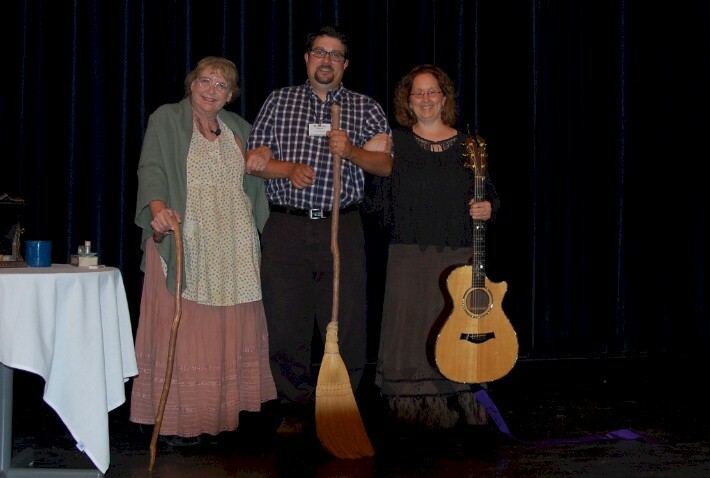 From there, we got the chance to relax at our hotel (Country Inn & Suites, Beckley) for an hour or two... and then we were off to the Tamarack Arts Center for dinner and a performance by Karen Vuranch. Karen is a theater teacher and professional actress who put on an hour-long monologue about living in a coal camp... she calls it "Coal Camp Memories". 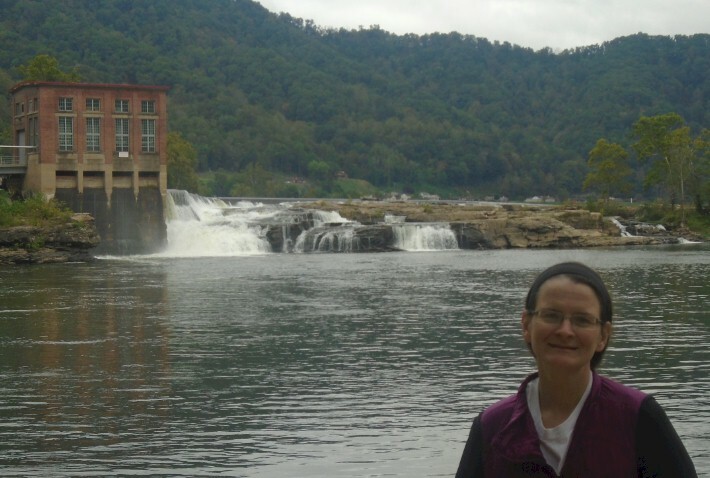 She starts off as a small child and gradually gets older in each act, telling about her life living in West Virginia's coal country. 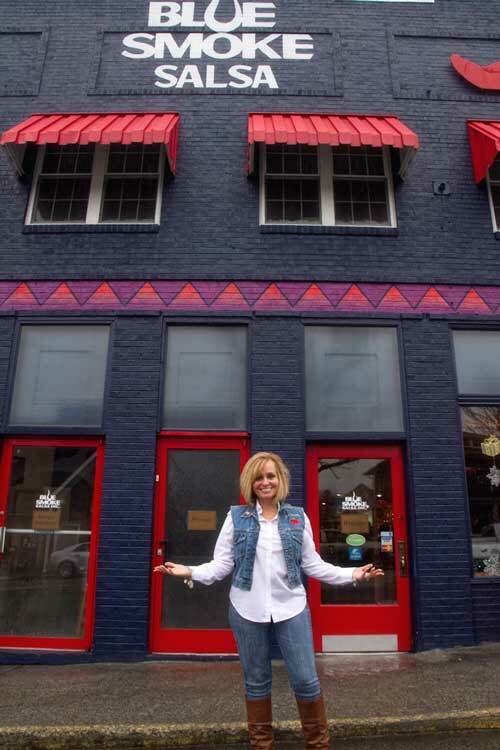 Karen's show was one of the many highlights of the trip - but the Tamarack Center is worth a trip in itself, as it's a showcase for West Virginia's talented artists, musicians, and chefs. You almost don't expect something of this caliber in rural West Virginia. 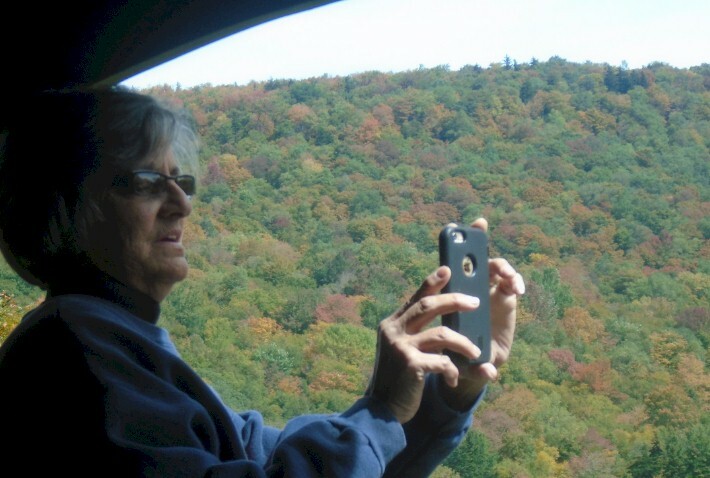 Day #3 of the Country Travel DISCOVERIES tour starts off with a ride on the motorcoach between Beckley and Cass; part of the time you are on the freeway, but most of the drive is down a rural two-lane state highway through Eastern West Virginia. 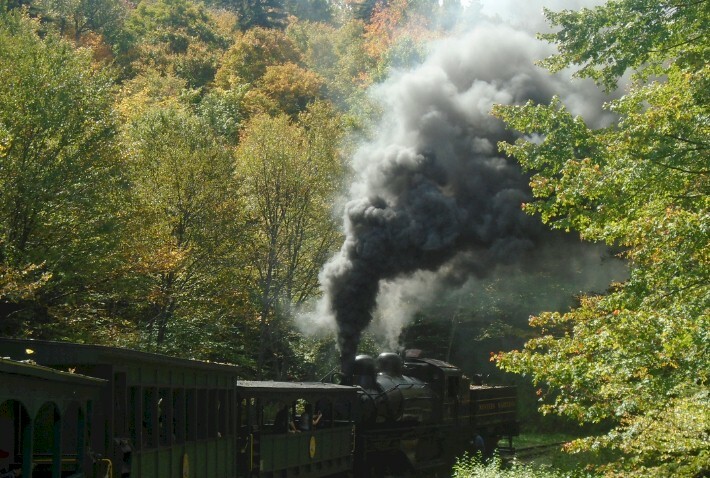 The destination for the morning is Cass Scenic Railroad State Park. Until the late 1800’s, this area of West Virginia was isolated wilderness, dotted with smaller settlements. This was in contrast to most of the Eastern United States, which was growing at an exponential pace. Railroads came to this area when the Chesapeake & Ohio constructed one of its main line routes between Richmond, Virginia and the Ohio River Valley. In 1897, the C&O chartered the Greenbrier Railway to build a new train route from the C&O main line at Whitcomb to the community of Marlinton. The first passenger train to operate between Whitcomb and Marlinton ran on October 26, 1900. Railroad officials were asked to extend this line further north so that the West Virginia Pulp and Paper Company could easily transport lumber from the mountains around Cass to its new paper mill in Covington, Virginia (lumber was in short supply in Western Virginia at the time). The railroad reached Cass by Christmas 1900 and West Virginia Pulp & Paper’s first shipment of pulp wood out of the area took place on January 28, 1901. The railroad line we traveled on, with several switchbacks, was part of a branch line built in 1901 to bring lumber off Back Allegheny Mountain to the lumber mills at Cass. The branch line would eventually reach a meadow area, now known as Whittaker Station, where a logging camp was established by the immigrants who were building the railroad. As virgin forests became exhausted in this area after just a decade, timber hauls on the line began to peak by 1910. While commercial tree farms led to some stabilization of the logging industry in West Virginia, it was not enough to start a slow and steady decline in output; many of the small mills closed as their timber tracts were stripped bare. All passenger service by the C&O ended in January 1958; Cass lumber operations ended around 1960. Following the closures, the line was sold to the Midwest Raleigh Corporation, which began to scrap the railroad and steam locomotives. 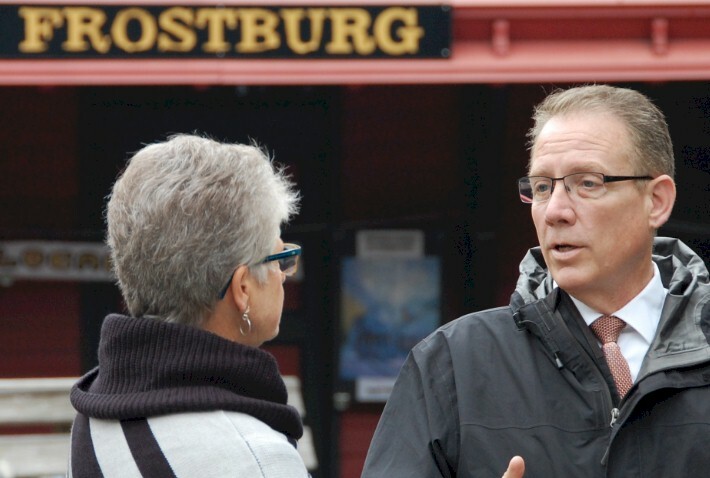 A group of local businessmen convinced the state to purchase the Cass Railroad. 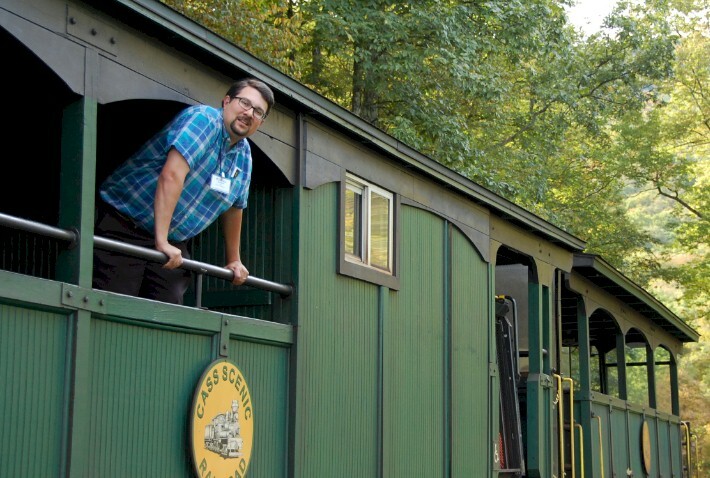 After years of rehabilitation, Cass Railroad State Park offered its first excursion in 1963. 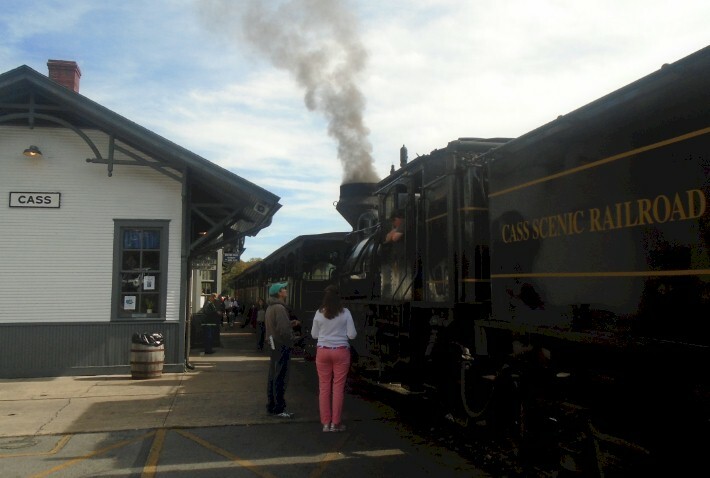 All aboard for the Cass Scenic Railroad! 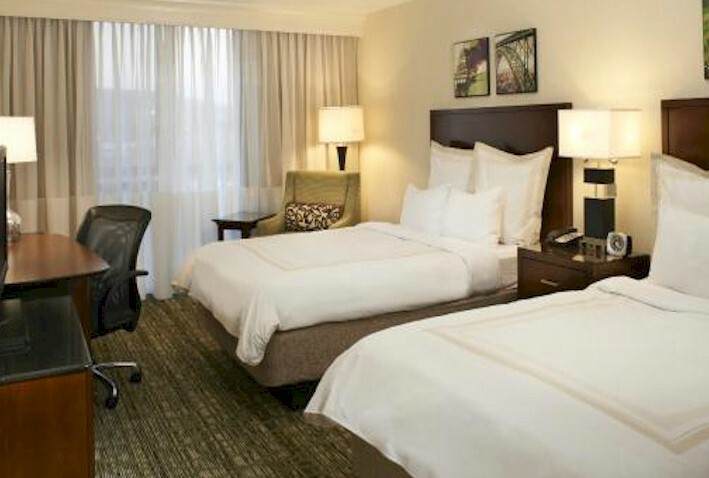 This night and the following night are spent at the Holiday Inn Express in Elkins, West Virginia; the hotel is located in the center of town and offers several good restaurants and activities to do on your own, with-in walking distance. 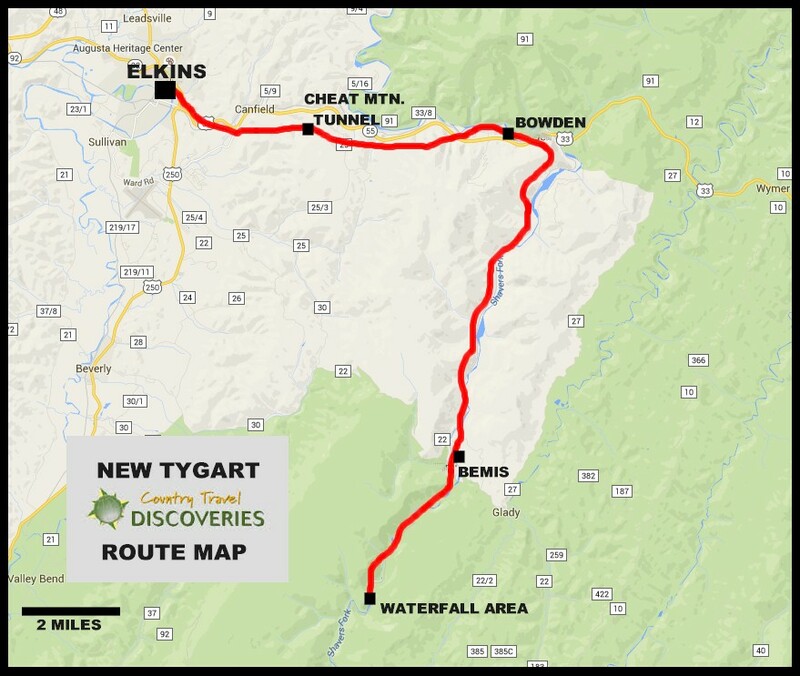 The fourth day of Country Travel DISCOVERIES West Virginia's Mountain Railroads tour is spent riding the New Tygart Flyer train. This 46-mile round-trip excursion from Elkins, West Virginia features an "S"-curve tunnel, a 1,500 feet deep canyon with densely forested slopes, and a high bridge over the meandering Sharvers Fork of the Cheat River. 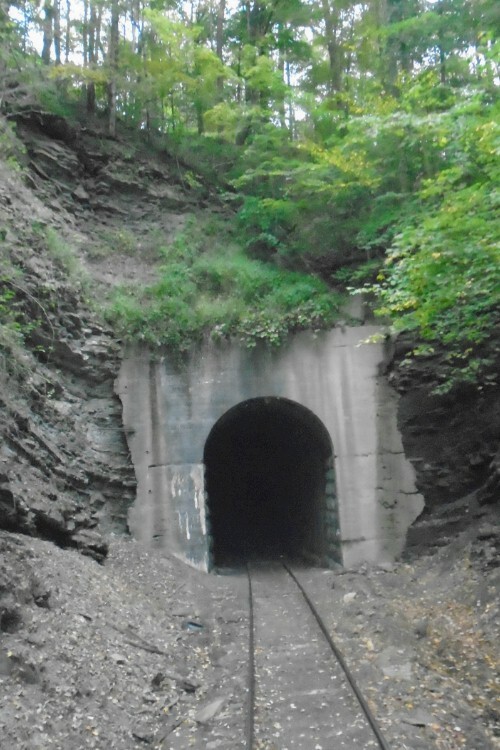 The Coal and Iron Railway, established in 1899 to facilitate logging operations, originated in Elkins, boring through the Cheat Mountain Tunnel and following the Shavers Fork of the Cheat River and the West Fork of the Greenbrier River into Durbin, where it connected with the Chesapeake and Ohio Railroad's Greenbrier Division. Although construction was completed in 1903, the Western Maryland's acquisition of the West Virginia Central and Pittsburgh only two years later resulted in the Coal and Iron Railway's re-designation as the "Durbin Subdivision." Elkins, located at the mouth of the Leading Creek and Tygart Valley rivers, was named after investor and Senator Stephen B. Elkins, who, along with Senator Henry Gassaway Davis, had been instrumental in both the railroad's and the town's growth. Originating to serve the workforce needed to maintain and operate the line, the expanding town had once featured maintenance shops and "Wild Mary's" freight yard, the staging area and western terminus of the many coal operations which had fanned out from the Elkins area, supported by a 900-strong team. 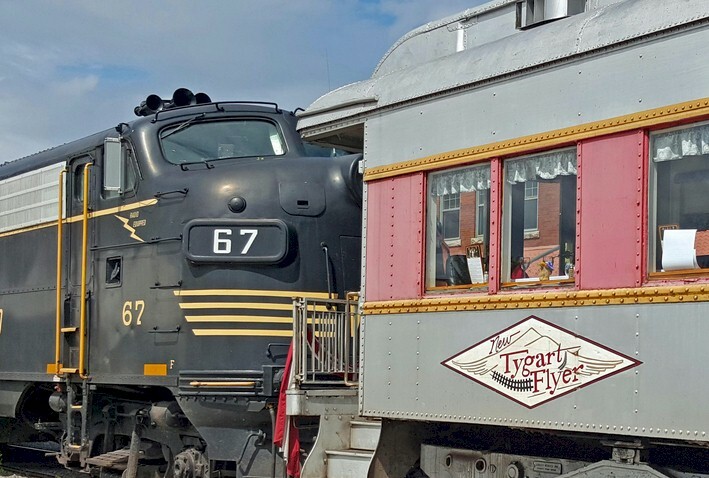 The line used by our trip on the New Tygart Flyer is now operated by the Durbin and Greenbrier Valley Railroad, a short-line company owned by John and Kathy Smith. Trains initially operated from Durbin until the Randolph County Development Authority reconstructed the old Western Maryland bridge, allowing it to re-establish rail access to the Elkins train depot abandoned by CSX in 1992, once the location of its 22-acre, roundhouse-equipped yard. 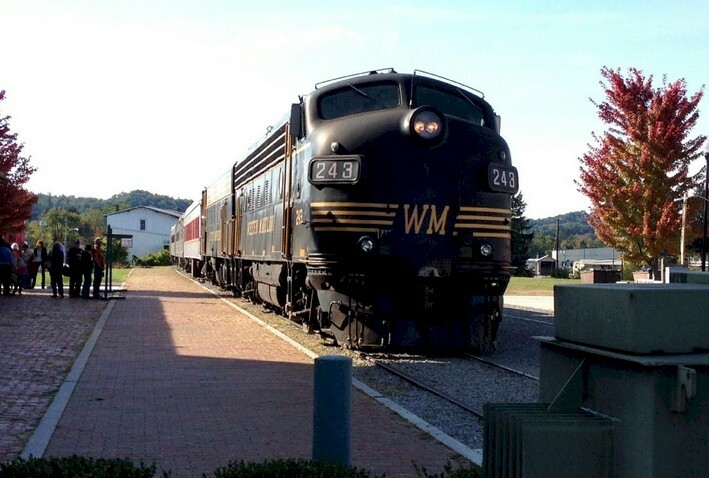 Elkins Depot: The restored depot, site of the Durbin and Greenbrier Valley Railroad's headquarters, is the departure point for three of its four excursion trains - the New Tygart Flyer, the Cheat Mountain Salamander, and the Mountain Express Dinner Train. 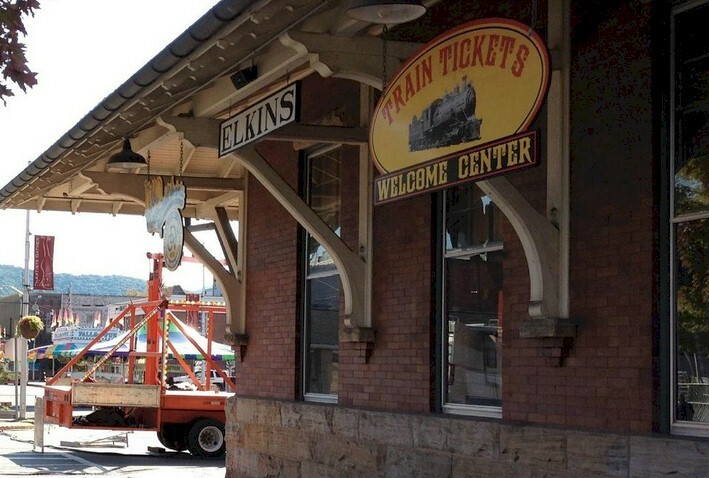 The Elkins depot once again serves as a railroad departure point and the town is once again the shopping, dining, hotel, and transportation hub of the east central Appalachian Mountains – of course, now for tourists. Leaving Elkins: Heading to the right on the switchback, and now pulled by its locomotives, the New Tygart Flyer will depart the Elkins yard limits at milepost 30.0, plunging through dense vegetation, as if the tracks provided a parting path through it. Inser Loop & Climbing Cheat Mountain: Negotiating the horseshoe-shaped Isner Loop two miles later, the train will begin its 2.8-percent graded ascent up Cheat Mountain. Brushing the slanted dirt and shale rock faces, it follows the arching, climbing rails, cradled by a deep ravine. 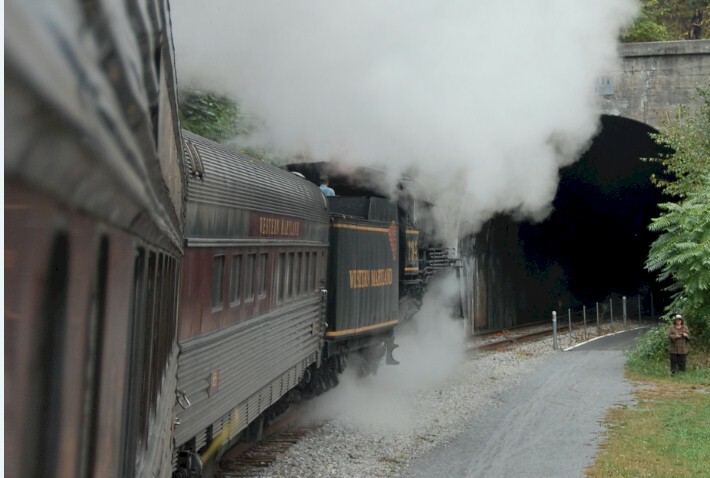 Cheat Mountain Summit & Tunnel: Reaching the summit at the Cheat Mountain Tunnel, the dual-locomotive, six-car train will plunge into the 1,717-foot-long, hand-carved, S-curved passage under the mountain's ridge. The light-outlined portal represents its entrance progressively decreasing in size until it flicked out behind the last car, and the forest-green views through the side windows, as if shades had suddenly been pulled over them, transformed into blackness. The narrow rock tunnel provided very tight clearance. Bowden: Re-descending into the Cheat River Valley at a two-percent graded rate, our train reaches the mountain's base at the small community of Bowden. A short, out-of-service track siding is passed by at Milepost 38.4. The cars lurched and sway as they snake behind the Western Maryland and Baltimore and Ohio locomotives, their whistles cracking open with every road-crossing traverse, momentarily intercepting, and then paralleling, the Shavers Fork of the Cheat River. More about the Cheat River: Located in the eastern Allegheny Mountains, the 88.5-mile-long river flows through Monongahela National Forest. It drains a 214-square-mile basin in rural and forested areas; it is part of the mighty Mississippi by means of the Cheat, Monongahela, and Ohio rivers. Rising in north-central Pocahontas County at Thorny Flat, itself situated on 4,848-foot Cheat Mountain, the Shavers Fork of the Cheat flows through the abandoned logging town of Spruce, location of its headwaters, before moving in a north-northeasterly direction through Randolph and Tucker Counties. 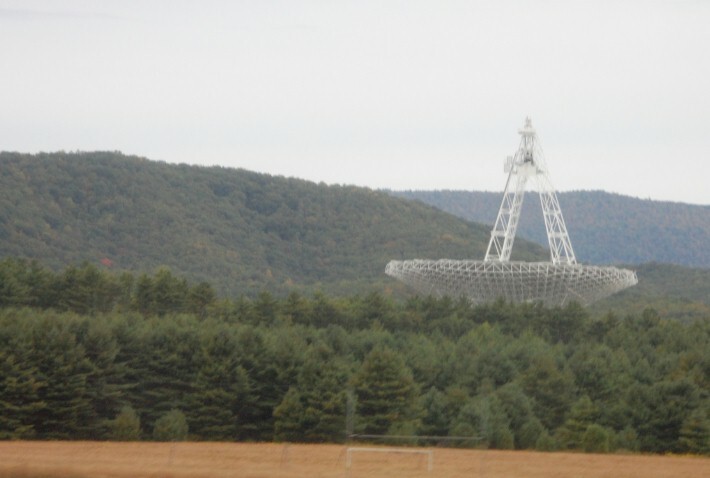 Its valley is formed by Cheat Mountain in the west and Shavers Mountain in the east. 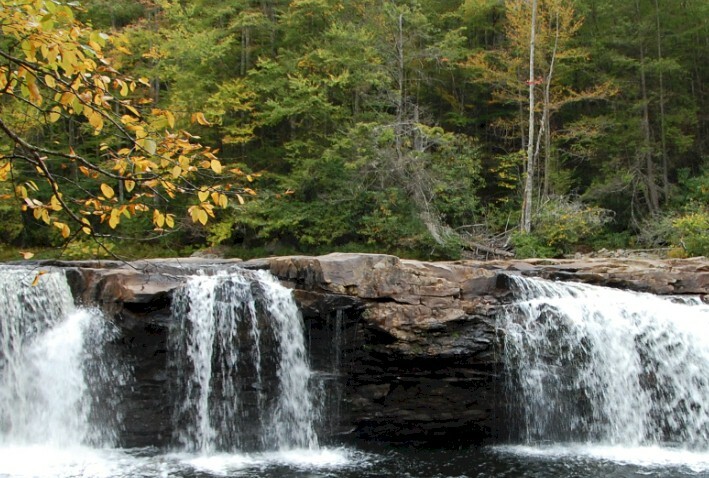 Joining Black Fork at Parsons, the Shavers Fork forms the Cheat River at a 1,621-foot elevation. Bemis: This town’s family oriented roots are what makes it the tight knit community it still is today. It got its name, Bemis in 1906 by Bemis & Sons from Bradford PA. They’d come to this area and built a large band mill putting timbering at the center of the town. 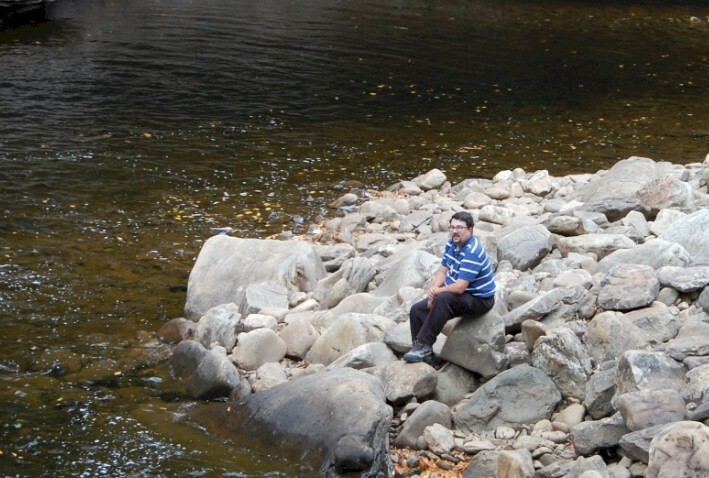 It had been called Camp Fishing Hawk, before it came to be known as Bemis. It had been used earlier as a railroad construction camp. After returning to Elkins, we enjoyed some time to relax at the hotel and a group dinner at a local restaurant. 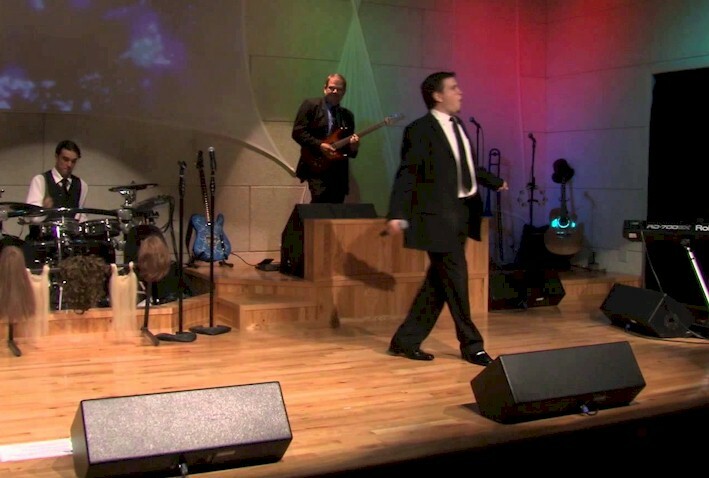 From there, it was off to the American Mountain Theater, which provided a Branson-style musical show. The singers and musicians have won several awards for their work... we especially liked the patriotic music they did. 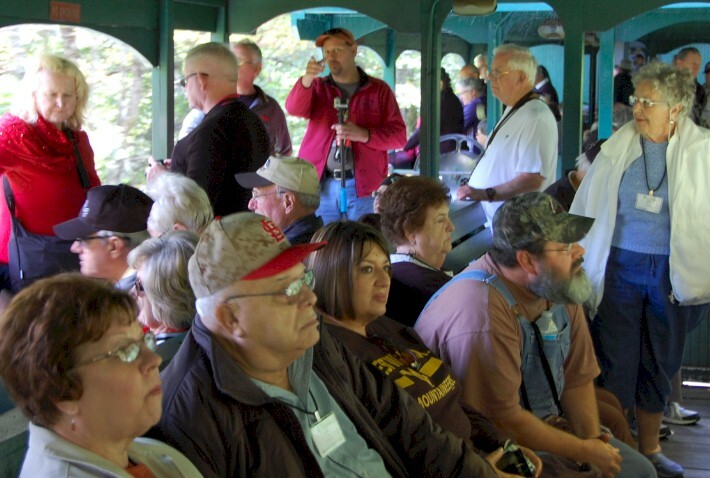 We all had our camera ready for one of America's most breathtaking train rides on Day #5 of our Country Travel DISCOVERIES tour - the Potomac Eagle Scenic Railroad. Hauled by a combination of four 1950's-era locomotives, we were treated to a narrated excursion past historic farms and lush mountain greenery, including evergreens, hardwoods and wildflowers. In the spectacular narrow valley called "the Trough", we passed above the Potomac River, where the water is so clear we were able to see fish swiming below! The history of Potomac Eagle route dates back well over 100 years. In 1909, the Hampshire Southern Railroad began construction on this branch rail line between Romney and Moorefield; service for freight and passengers began the following year. The line was sold in 1911 to the Moorefield and Virginia Company. Just two years later, the line was transferred to the Baltimore and Ohio Railroad. Passenger service was abandoned relatively early on – around 1928. For nearly 50 years, the line was still used by the Baltimore & Ohio for freight trains. However, it was eventually abandoned in the mid-1970’s. Luckily, the tracks were not torn up; instead, the line was taken over by the State of West Virginia on October 11, 1978. State government officials were concerned that if the line became inoperable, it would cause harm to then-existing and future industry in the region. Track rehabilitation began on the 52-mile stretch, but the famous flood of 1985 knocked out four bridges and left 13 miles of track with heavy damage. It was reported that in some areas of “the Trough”, that rail and ties hung in mid-air with all traces of road bed gone beneath them. Today, the tracks are owned and operated by the West Virginia State Rail Authority. 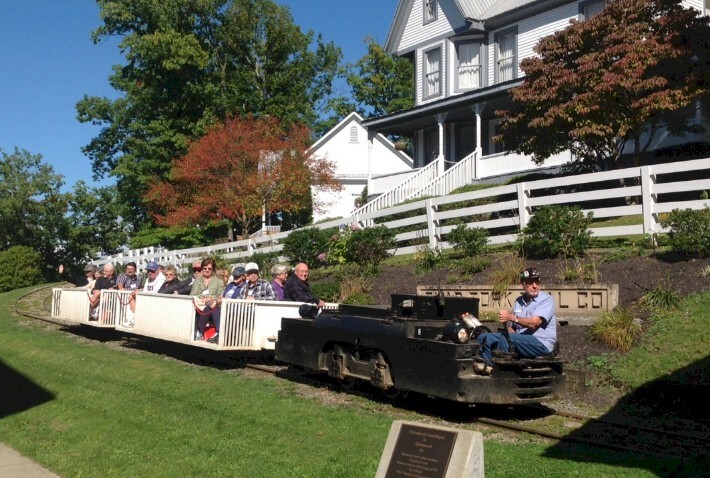 Trains, including our Potomac Eagle run, are operated by the South Branch Valley Railroad. Freight traffic also operates on this line Monday through Friday, with special and unit trains operating on weekends, when needed. 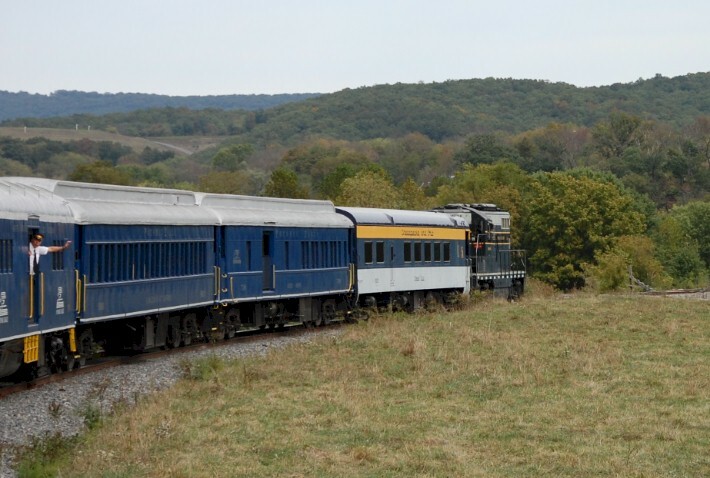 The first Potomac Eagle tourist train operated in 1991. One of the things that really stood out while riding the Potomac Eagle was the historic locomotives. We got the chance to speak to the Executive Director of the railroad who gave us a little more history for this TrainWeb article. Potomac Eagle #722 Locomotive, which is pictured above, has a long and storied past. 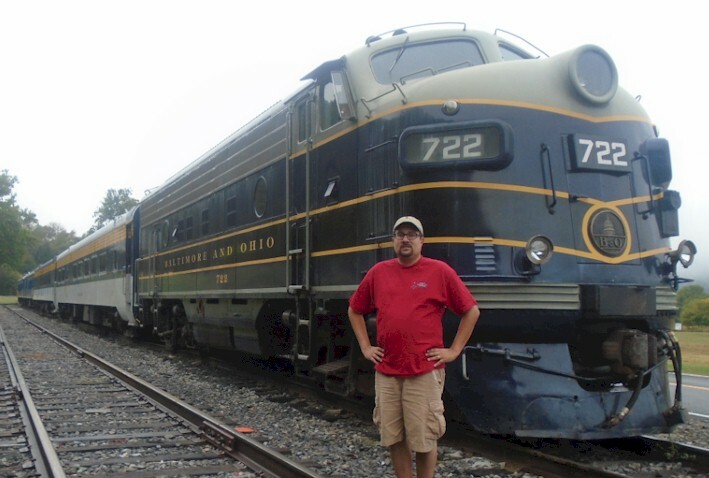 While looking for a door as part of a grant project to restore a locomotive for the C&O Historical Society, David Corbitt, president of the Potomac Eagle Scenic Railroad, and Charlie Sayre, a retired CSX locomotive engineer, discovered an F-7 locomotive in a Youngstown, Ohio salvage yard. Corbitt was in one part of the salvage yard looking for a door while Sayre was looking in another area. Sayre spotted the 1952 locomotive and urged Corbitt to take a look. A short time later a deal was struck for the locomotive with LTE Rail Services, owners of the F-7. Potomac Eagle Scenic Railroad employees worked with LTE's staff to make the repairs. Lettering for the Potomac Eagle's name was performed and a target date of September 1, 2002, was set for the locomotive to arrive at Wapocoma Station in Romney. Two days before the deadline, Potomac Eagle's restored #722 arrived at the CSX yards in Cumberland, Maryland, and on August 31, 2002, it was turned around and moved to Green Spring, West Virginia. 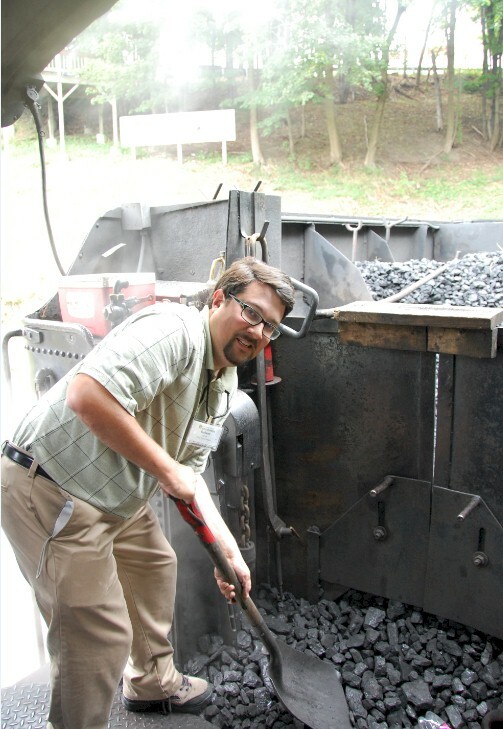 Potomac Eagle engineer Craig Yokum moved the locomotive to Wapocoma Station on September 1, 2002. The F-7 was built new in 1952 for the Bessemer and Lake Erie Railroad. It was part of the first wave of new diesel locomotives to replace steam engines. The #722 was built by Electro Motive Division of General Motors Corporation in La Grange, Illinois (a suburb of Chicago). After approximately 25 years of general service hauling coal, coke and iron ore between the Great Lakes and Pittsburgh, the unit became part of a small program that would extend the unit's useful life on a Class 1 carrier. The unit was retrofitted for special remote control operation involving the B&LE's dock facility in Conneaut, Ohio. The other locomotives that are sometimes used include: Baltimore & Ohio GP-9 #6604 (it was built in 1955 and spent time on the Central Railroad of New Jersey), Chessie System GP-9 #6240 (it was built in 1957), and Chesapeake & Ohio F3Au #8016 (it was built in 1949). 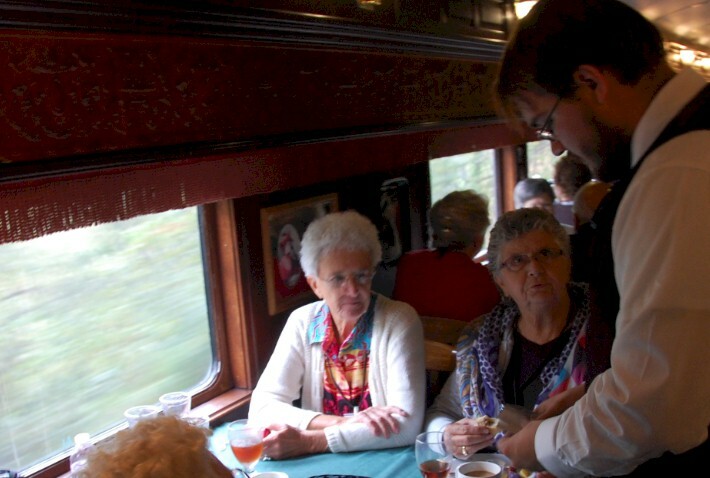 Our ride started with a catered lunch in one of the table cars. From there, we claimed our seats in one of the regular passenger coaches. Most of these cars came from commuter rail service on the Canadian National, however several are of B&O heritage. Typical seating in these cars are cushioned, reversible seats where passengers can move the seat-back in order to face in either direction. Despite the comfy coach seating, we spent most of our time standing in two open-air cars that was located just behind the locomotives on the south end of the train. One of them is an open-top gondola car that had been used to carry freight (like pipes or railroad ties). That car has been outfitted with benches, so passengers can step outside to partake in the view of "the Trough". The second open-air car is covered, but has large wide-open windows where you can lean out a little bit to get a better look. This car is one of several where restrooms are located. The "open air" car on the Potomac Eagle is excellent for viewing scenery going through a narrow canyon called "the Trough"
Even though the train equipment was fascinating in of itself, our favorite memories of riding the Potomac Eagle included spotting more than a dozen American Bald Eagles from the train. Train staff communicate with each other and even slow down when the train comes to a bald eagle. The narrator provided us with a lot of interesting facts that we didn't know about these amazing birds. 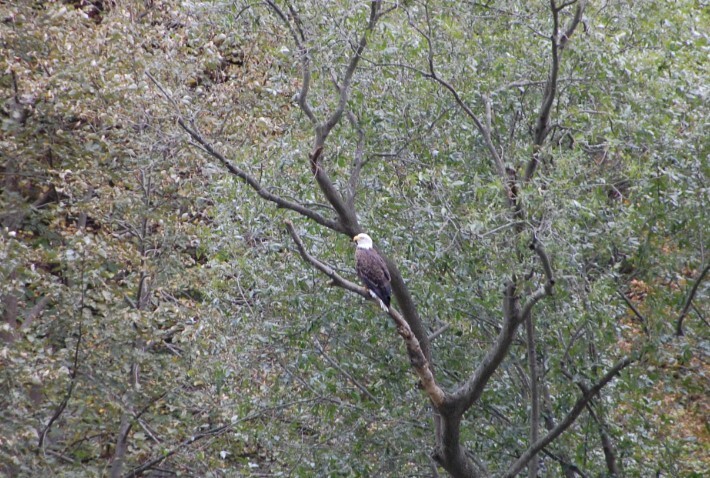 For example, when a pair of bald eagles build a new nest, their first job is to find a place for it. They will often choose a location close to water, like here along the Potomac River where they can catch fish for their babies without wasting time flying back and forth a long distance. In forested areas, they select one of the tallest trees. This allows the eagles to see all around the forest, and also fly into the nest without hitting their wings against branches. Eagles will often reuse nests, continuing to build on them for many years; this is how we are able to note the nest here. Throughout the season, and sometimes during the fall and winter, eagles keep adding sticks to the nest. They naturally take as many sticks as they can find close to the nest, but may lug some branches as far as a mile, carrying them in their talons. 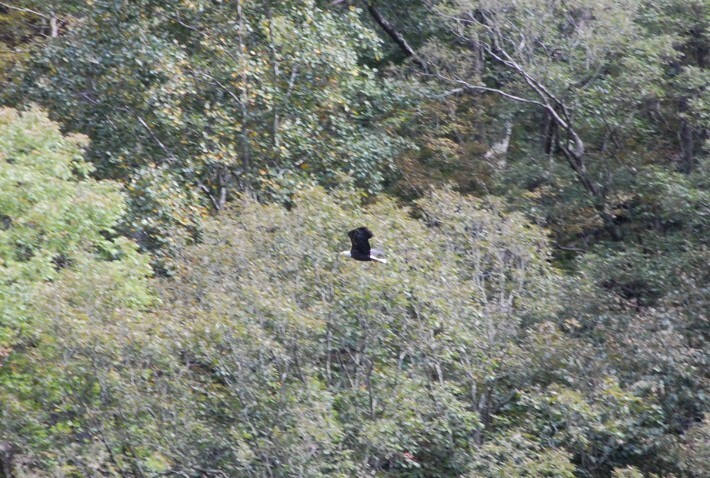 During the warmer months when leaves are on the trees, it is almost impossible to see the bald eagle’s nest here. Making the nest even hard to see, eagles, along with several other hawks, add sprigs of greenery to their nests throughout the spring and summer. No one knows why they do this, but scientists think it might be to provide a bit of camouflage, serve as an insect repellent, or provide a signal to other eagles that the nest is well-tended and will be occupied again. The average bald eagle nest is around five or six feet in diameter and around two to three feet tall; the first year it is built, the nest may be much smaller than that. In most regions, a pair of eagles start working on re-building their nest for the season a few months before the female lays the first egg. Eagles will often line the very bottom of the nests with their own feathers to provide a soft protective layer for their eggs. A pair of bald eagles that was being studied in Ohio came back and used the exact same nest for a period of 34 years, until the tree and nest were blown down in a storm. Eagles will often remain at the same nesting location as long as their nest is secure. 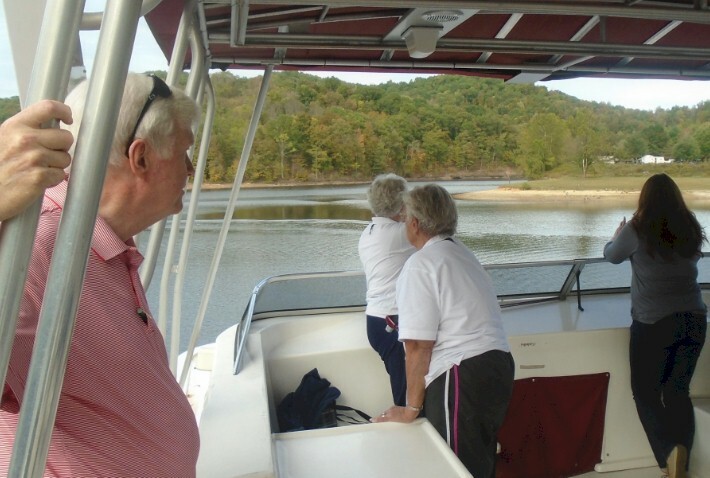 Our last full day of our County Travel DISCOVERIES tour began with a ride on the motorcoach from the South Branch Inn in Romney to the Visitor Center at the Chesapeake & Ohio Canal National Historical Park in Cumberland, Maryland. We had about one hour of free time at the C&O Canal National Historical Park in Cumberland before the departure of our Western Maryland Scenic Railroad excursion. Most of our fellow travelers decided to check out the historical displays and movie at the Visitor Center, but since it was a nice day we decided to go for a hike along the towpath along the old canal. While we only walked about two miles, one could potentially hike the entire 150+ mile trail from Cumberland, Maryland to the Georgetown neighborhood of Washington, D.C. The Western Maryland Scenic Railroad excursion train operates over a right-of-way that was once owned by Western Maryland Railroad, which operated lines in portions of Maryland, West Virginia, and Pennsylvania. The original main line began with the chartering of the Baltimore, Carroll and Frederick Railroad in 1852, with the intent of building a rail line from Baltimore to Washington County, Maryland. The Maryland General Assembly changed the name of the company to the Western Maryland Railroad Company in 1853, and construction began from Owings Mills, Maryland (near Baltimore) in 1857. The railroad was completed to Westminster in 1861 and Union Bridge in 1862. Further expansion was delayed because of the Civil War. The Western Maryland Railroad did not reach Cumberland until 1906. It was primarily a coal hauling and freight railroad, with a small passenger train operation. The Western Maryland became part of the Chessie System in 1973, although it continued independent operations until May 1975, after which time many of its lines were abandoned in favor of parallel Baltimore and Ohio Railroad lines. In 1983, it was fully merged into the Baltimore & Ohio Railroad, which later was also merged into the Chessie System with the former Chesapeake and Ohio Railroad, which is now CSX. 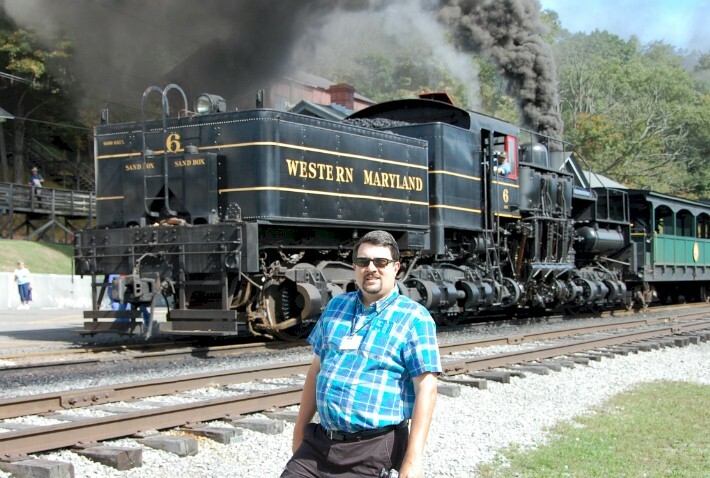 The Western Maryland Scenic Railroad (WMSR) has been operating excursions out of Cumberland since 1988. 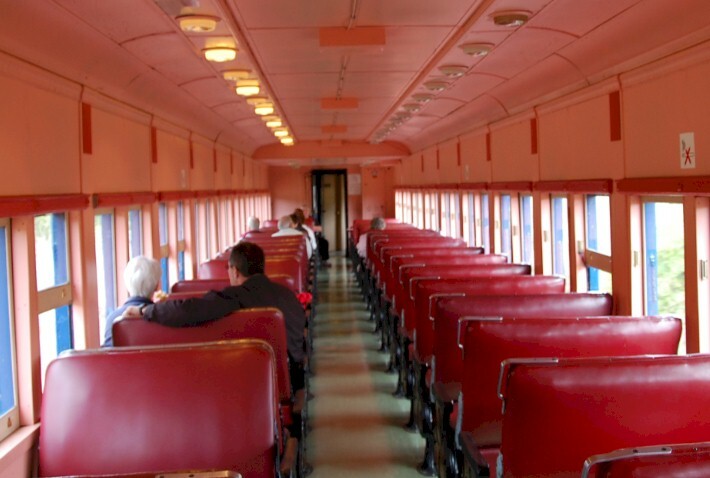 Since its creation, the WMSR has gained an extensive collection of light weight style passenger coaches, many of which it has restored into service. 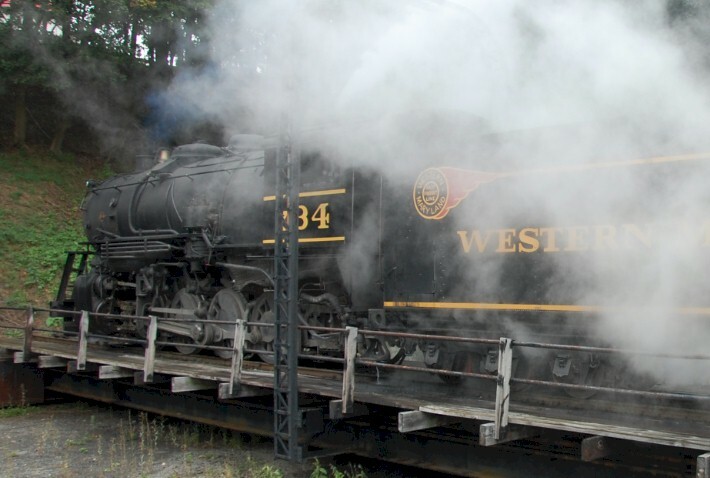 The Western Maryland Scenic Railroad offers travelers four different classes of travel on their standard excursion trains. Standard coach is available every day. Seating is padded, high-back, bench-style seats. Most seats are located by large windows and seat two on either side of the aisle. There is no reserved seating in standard coach class, a huge downside in our opinion. Also offered is premium coach. 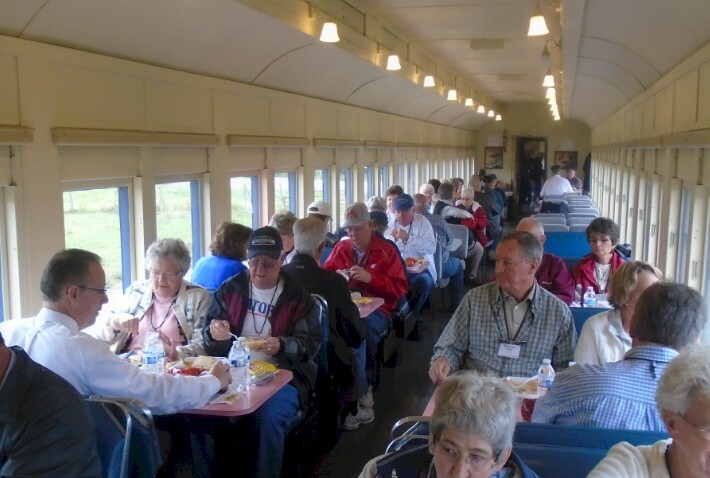 Guests have reserved seating in the Western Maryland Scenic Railroad's more comfortable and spacious coaches. Similar to airline seating, these seats in premium coach recline slightly and have foot rests. Seating is limited. One step up from premium coach is Parlor Class; the leather lounge chairs here are the most comfortable on the train! A cash bar of beer and wine is available. Country Travel DISCOVERIES travelers get the best service on the train - and that is in First Class. This special service is only offered by the Western Maryland Railroad on Saturdays and Sundays during the summer season. 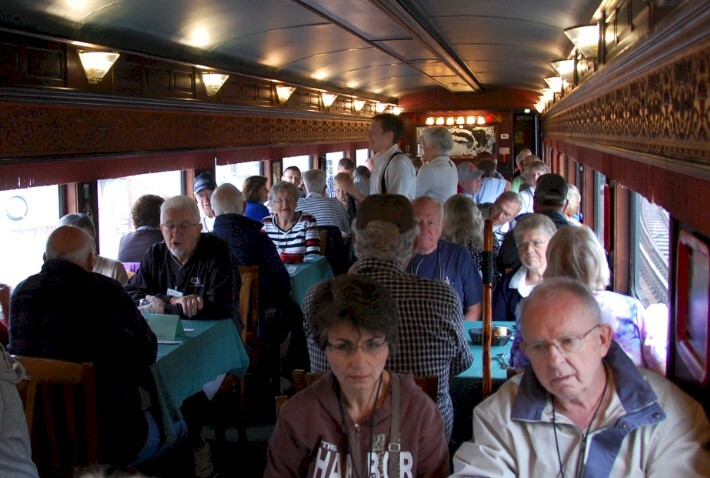 A full multi-course lunch is served in a refurbished dining car! This makes the last train offered on this trip - one to truly remember! Cumberland Depot: The Western Maryland Railway Station stands as the last remaining building linked directly to Cumberland, Maryland’s role as a major railroad center. During the 19th century, three major transportation routes began or ended in Cumberland - the National Road, the Baltimore & Ohio Railroad, and the Chesapeake & Ohio Canal. Cumberland prospered by helping transport raw materials, products, and even people between the East Coast and new states. The station was constructed in 1913 during the height of the railroad's success in Western Maryland. Today, the Station remains active and is utilized as the headquarters of the Canal Place Preservation & Development Authority and the Western Maryland Scenic Railroad, as well as housing a C&O Canal National Historic Park exhibit and visitor's center and numerous other offices. The location is also part of Maryland's first Certified Heritage Area. Downtown Cumberland: Downtown Cumberland can be seen on the right side of the train shortly after departing the depot. 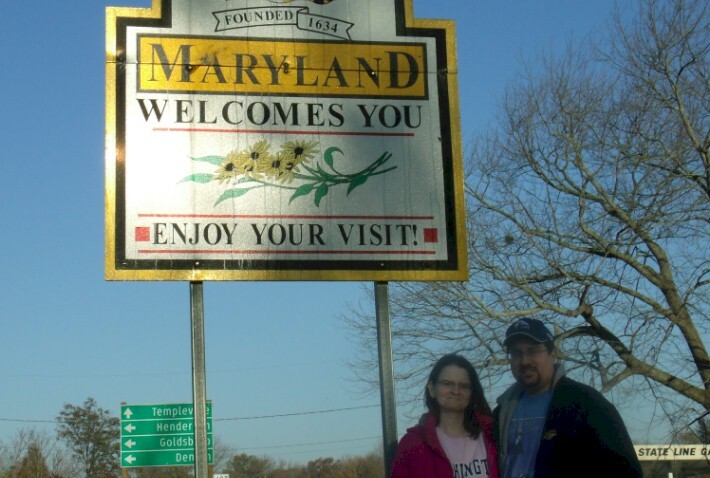 Historically, Cumberland was known as the “Queen City”, as it was once the second largest city in the state of Maryland. Because of its strategic location on what became known as the Cumberland Road through the Appalachians, after the American Revolution it served as a historical outfitting and staging point for westward emigrant trail migrations throughout the first half of the 1800’s. Today, it has a population of around 20,200 residents. The city’s elegant downtown area flourishes with restaurants, antiques, shops, live theater, art studios, and corporate offices. The Narrows: This cut in the Allegheny Front was America’s first Gateway to the West, used by the National Road, the B&O, C&P, and Western Maryland Railways. Double Truss Bridge #1679: Leaving the Narrows, our train crosses the National Road before heading north past Wills Mountain toward Mount Savage. Helmstetter's Curve: A favorite photo spot for train buffs, Helmstetter’s Curve is a �-mile arc that sweeps across Cash Valley, looking very much as it did in the hey-day of steam railroading. Brush Tunnel: If it looks familiar, you may remember this tunnel from the "Pontiac Montana" commercial shot here a few years ago! Riders especially enjoy entering and exiting this curving portal. Woodcock Hollow: A hairpin turn and an increase in grade are sure signs that we have arrived at Woodcock Hollow, rarely seen until the Western Maryland Scenic Railroad opened in 1988. Frostburg Depot: Built in 1891 by the Cumberland and Pennsylvania Railroad Company, the depot saw regular business for the two daily trains between Cumberland, Maryland and Piedmont, West Virginia, via Frostburg. The C&P was a small local railroad, but it connected these communities to the B&O, Western Maryland, and Pennsylvania railroads. Service was discontinued in 1942 when car travel on the National Road made the rail service unsustainable. Abandoned in 1973, the depot was restored years later in 1989 for the Western Maryland Scenic Railroad. There is a turntable at the depot where the crew turns the engine for the excursions. Also, the Thrasher Carriage Museum is open for visitors; free admission for train passengers. 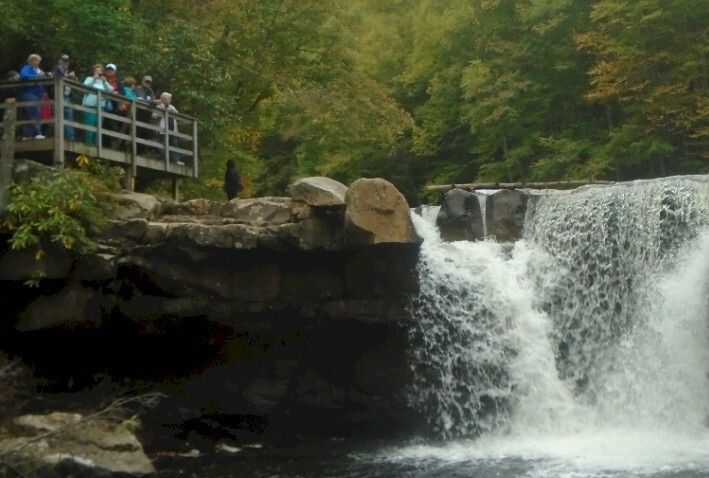 The site also serves as a trailhead for the Great Allegheny Passage, a popular rail trail offering 141 miles of hiking and biking in Maryland and Pennsylvania. 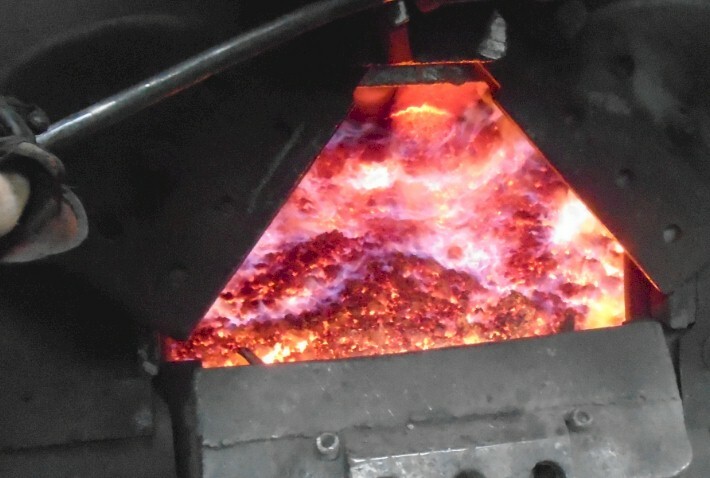 The Turntable at the Frostburg Depot: One of the most entertaining parts of the trip is watching the crew turn the engine on the turntable from any of the numerous decks leading up to Frostburg’s Main Street... check out the photo below. After leaving Frostburg, we took a two hour motorcoach ride to the Stonewall Jackson State Park; it is located off Interstate 79 in Central West Virginia. Stonewall Jackson is truly a four-star resort property with several restaurants, pools, gift shops, and even a massage parlor and gift shop. We spent the evening saying "goodbye" to our fellow Country Travel DISCOVERIES travelers by taking an hour-long boat ride on Stonewall Jackson Lake. 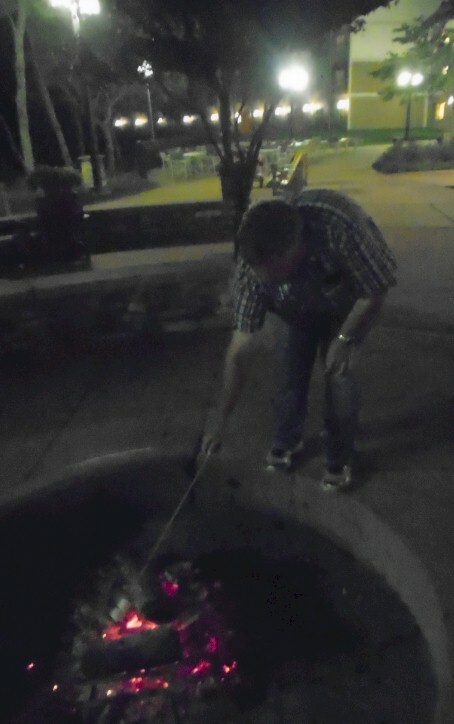 This was followed by spending sometime on the back porch of the resort making smores from a smores kit they had for sale in the convenience store at the resort. What a memorable way to spend your last night on tour! 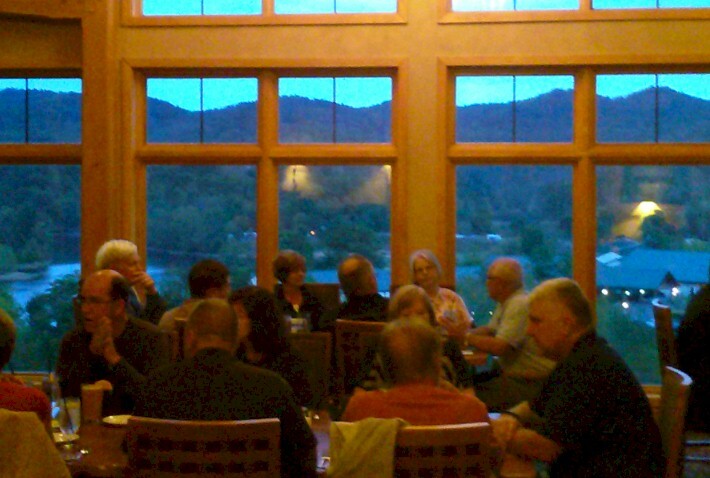 Country Travel DISCOVERIES travelers enjoy a farewell dinner on their own at one of Stonewall Jackson's many dining rooms - look at that view! Most of the last morning of the Country Travel DISCOVERIES West Virginia's Mountain Railroad Tour is spent traveling from Stonewall Jackson Resort back to Charleston. 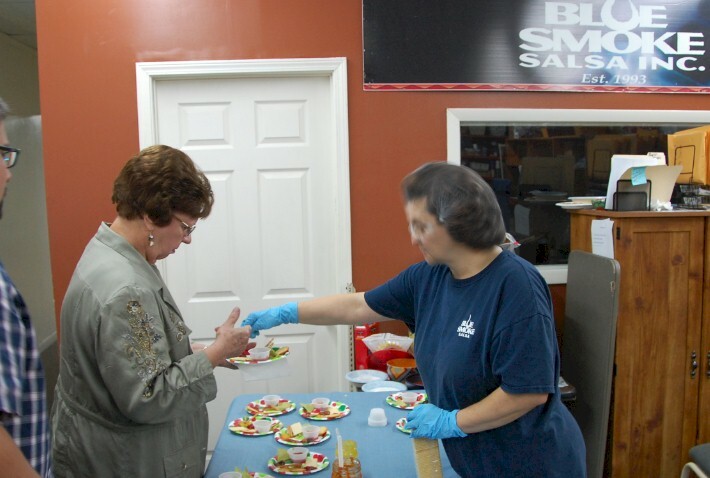 However, a stop is made at a local business called Appalachian Glass. 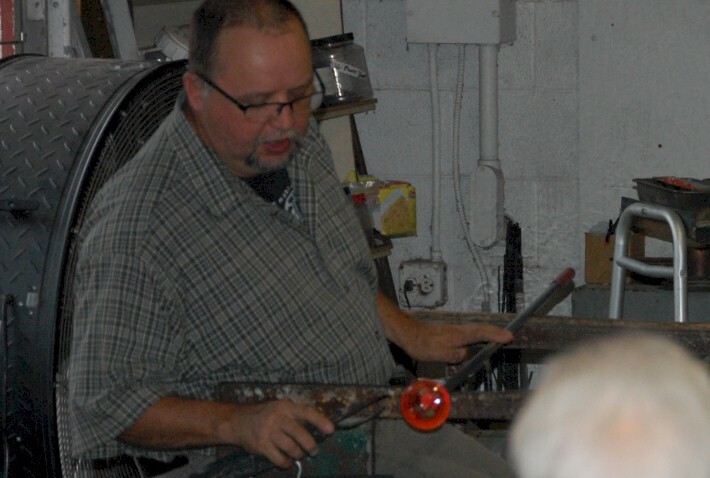 There, you get to meet local artists who will show you how they create hand-blown glass "friendship balls"; these were common gifts people would give each other in West Virginia during the 1800's. After a farewell luncheon back at the Charleston Marriott Town Center, all of the travelers parted ways. We caught a flight back to Illinois, and our friend Mike caught his own flight back to Boston. What an amazing week spent on this Country Travel DISCOVERIES tour! We truly headed home with happy memories of rail adventure and mountain splendor. 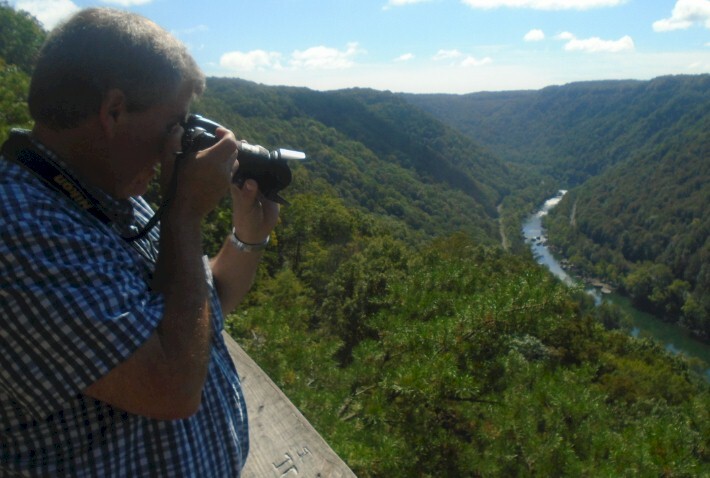 Come and enjoy - Wild, Wonderful, West Virginia - on Country Travel DISCOVERIES' West Virginia's Mountain Railroads Tour Today! 2016 TRAVEL OPPORTUNITIES -- SAVE UPTO $500 PER COUPLE WITH THIS SPECIAL OFFER! As we mentioned early on in this TrainWeb article, one of the beautiful things about participating in a group tour like this is that all of the tickets, hotels, attractions, etc. are pre-planned for you -- meaning there is absolutely no worry or hassle when it comes to seeing the Mountain Railroads of West Virginia. 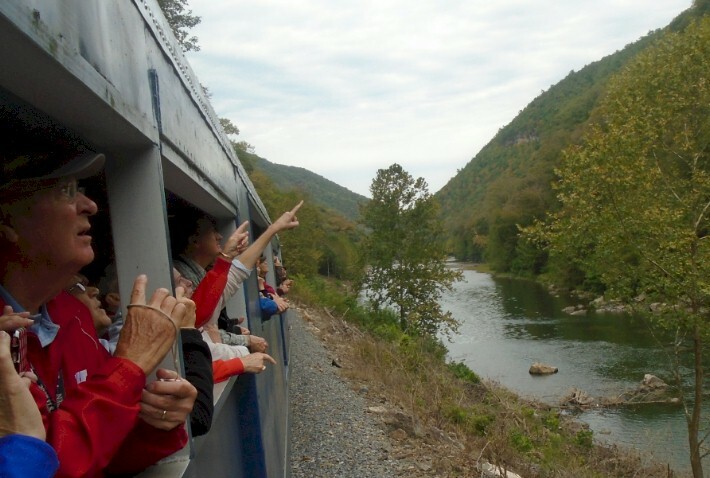 If this tour looks like something you are interesting in doing, then you will be happy to know that Country Travel DISCOVERIES will be offering three different departures of their West Virginia's Mountain Railroads Tour later this summer and fall. Trips will be from August 16-22, 2016, September 20-26, 2016, and October 3-9, 2016. For pricing and more information, you can check out their website through the links below, or call one of their reservation agents toll-free at (855) 744-TRIP. A SPECIAL OFFER WILL SAVE YOU $200.00 PER COUPLE ON THIS TOUR. 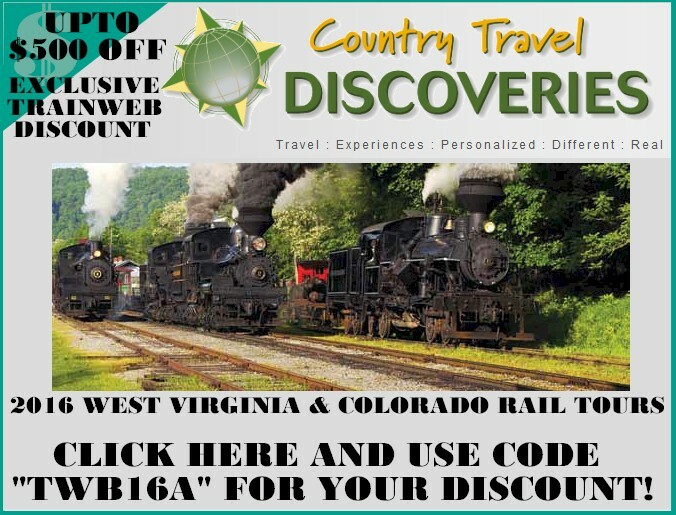 BOOK BOTH WEST VIRGINIA & COLORADO RAIL TRIPS, AND SAVE $250 PER COUPLE ON EACH TRIP... THANKS TO OUR PARTNERSHIP WITH COUNTRY TRAVEL DISCOVERIES! WATCH A VIDEO ABOUT THIS TOUR!